Serotonin is a chemical in the brain which has a high effect on a persons’ mood. It is often called the happy chemical because its effects result in a feeling of well-being and happiness. Its scientific name is 5-hydroxytryptamine or 5-HT. It is mainly found in the brain although it is also found in the bowels and blood platelets. What does serotonin have to do with depression? 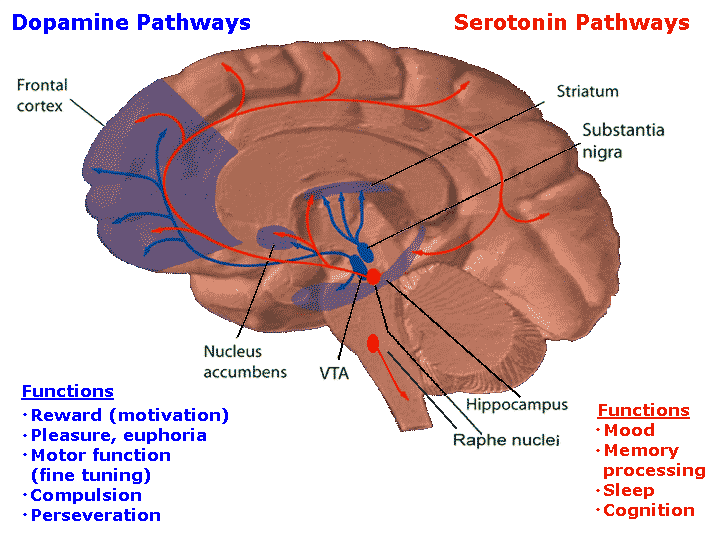 A serotonin hypothesis makes the claim that diminished activity of serotonin pathways plays a casual but worth mentioning role in the pathophysiology of depression. This theory is almost 50 years old. While there is still no concrete proof of these claims, certain studies of tryptophan depletion have found that serotonin does play a role in the pathophysiology of depression. Whether its true or not remains uncertain as of now and more research is needed. How do you go about giving a boost to your serotonin levels? If you’d like to go about it as naturally as possible, try changing up your diet. Certain foods have a noticeable effect on serotonin levels. Examples of foods which do this are eggs, cheese, pineapples, tofu, salmon, nuts and seeds and much more. It helps that these foods are delicious too. Eating a B complex vitamin can do wonders for your mood. Keep a couple at your work desk or at home and pop one whenever you feel like your mood is going to take a turn for the worse. You should feel better after half an hour when the vitamin starts getting digested. Go outside more. Sunshine has been found to be the quickest way to brighten up your day. Start with a few short walks in the morning. From there, you can work up to doing it every day. Unless its freezing cold, you’d do yourself a lot of good by giving your body some much-needed exposure to the sun every day. Exercise and exercise some more. Exercise is one of the best ways of naturally increasing your serotonin levels. There’s a reason that many people get addicted to exercise. After you exercise, your body releases plenty of feel-good chemicals so that your body doesn’t hurt after all the physical stress you’ve put on it. This feeling is good for you because it is a natural response to healthy actions. Exercise has even boosted serotonin levels better than medicines designed to do boost serotonin in certain cases. If all of these tips don’t help you. Consider visiting a therapist for therapy from Collaborative Therapeutic Services in Tampa, Florida. Our counselors have plenty of experience counseling other people with a variety of problems and so it’s very likely that they’ll be able to help you. Take the first step in getting help if you feel like you need it by giving them a call or emailing them. They’ll be more than happy to talk to you and answer any queries you might have.